How do we fight for peace? In my last article, I spent a lot of time discussing the value of the inner aspects of peace activism. Those elements are totally important, yes, but I feel called to celebrate organized peaceful protest as well. 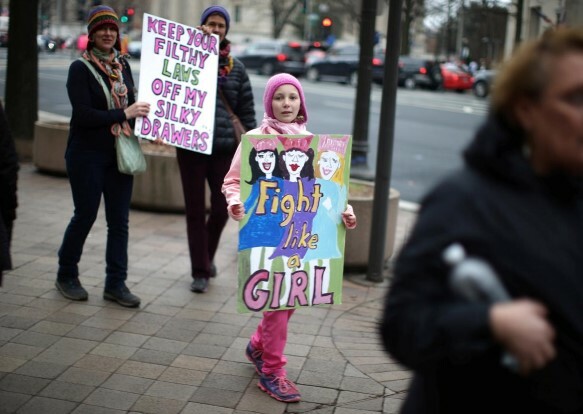 This comes on the heels of the the US Women’s March, which saw as many as three times the number of participants as the presidential inauguration. Simply joining together en masse makes an unmistakable statement. 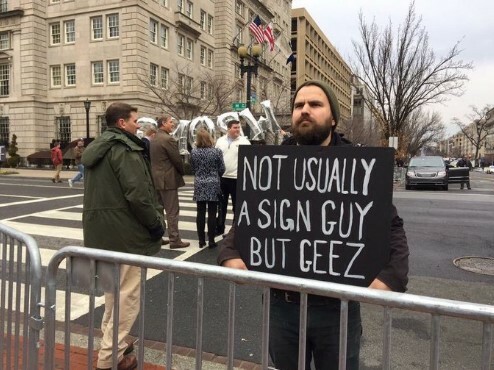 So in honor of the peaceful, outward manifestations of protest, let’s celebrate one of the most visible aspects of modern political activism: the protest sign. The protest sign is such a powerful icon for marchers fighting to improve human rights and policy issues because it offers a succinct and memorable synopsis of the issue at hand. And oftentimes it serves to humanize and individualize the marcher. Just take a look at these protest signs from the 1960s. It doesn’t hurt that these bite-sized sentiments can be captured with a single flash of a camera. 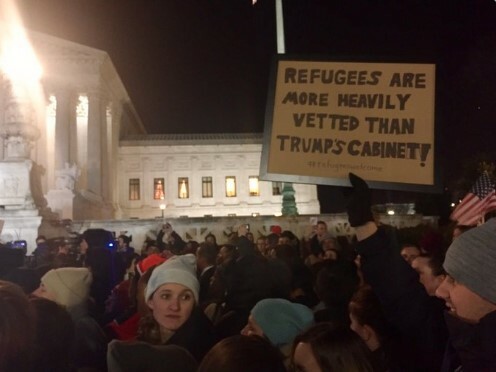 Of course protest signs are more than your typical handheld sandwich signs. As we recently learned through Greenpeace’s post-inauguration “Resist“ demonstration, sometimes you need a big sign in order to make a big statement. Large-scale signs can make a bold statement from cranes, storefronts, and freeway overpasses. 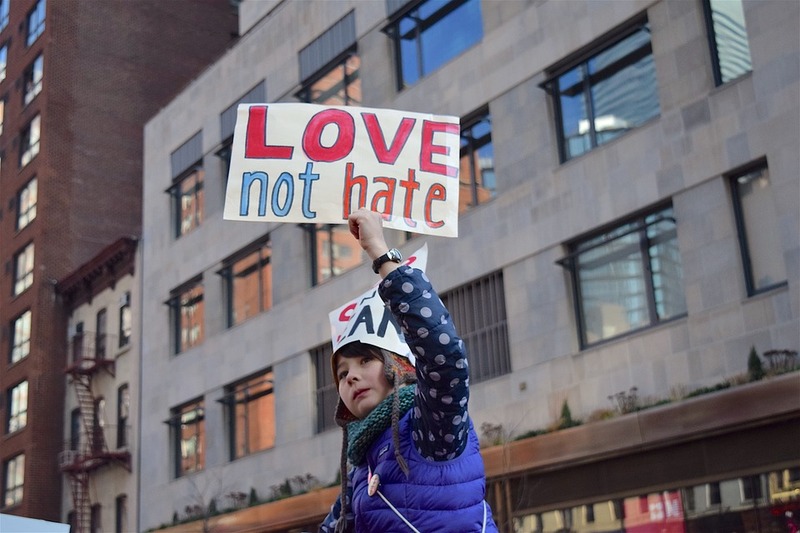 They serve as semi-permanent reminders of one’s resistance, a well-made sign can be like street art, and embodies support for a cause beyond just an individual. That is to say, by hanging a protest banner in your storefront, you’re saying that everyone involved in the business supports the cause. That sort of statement is rarely seen these days — perhaps PC Principal is to blame, eh hem? — but making a statement as a collective, when the sentiments expressed are true for everyone involved, has a hugely powerful impact. Now, just a quick PSA for anyone thinking about using a large sign as a protest element.To hang a big sign, a person usually has to climb somewhere very high. Every year, 500,000 people go to the doctor for ladder-related injuries. The causes behind these accidents are all totally preventable — picking the right kind of ladder, setting it up at a decent angle (76 degrees), avoiding old rickety ladders, and for goodness sake don’t stand on the top rung. It might sound trite, but it’s a real concern. We all want you to live another day to hold another protest sign. Since we’re being practical here, it’s worth noting that some states actually have regulations on protest signs. They can’t regulate what the signs say, obviously –thank you first amendment — but they can regulate what the signs are made of. It’s purely for safety insofar as I can tell. 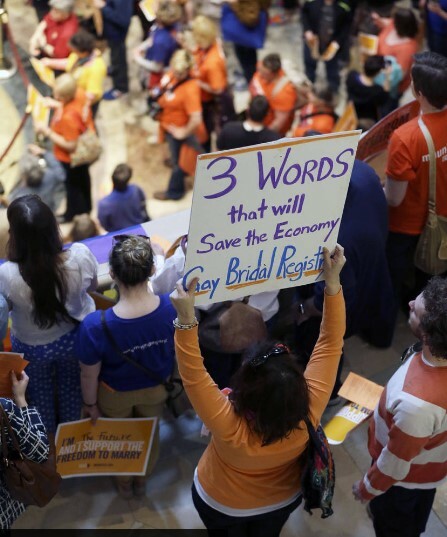 Generally speaking, protest signs really don’t need wood, metal, or PVC pipe handles. And if the lack of those materials eases tensions over the concern that they might be used as weapons, all the better. The aim is peaceful protest, no matter what. Whether you’re marching in an organized event or hanging a statement of protest from the window of a local business, be proud. You are making a change. And who knows, if your sign hits a nerve and speaks to the people, maybe history will remember your individual voice and fight.